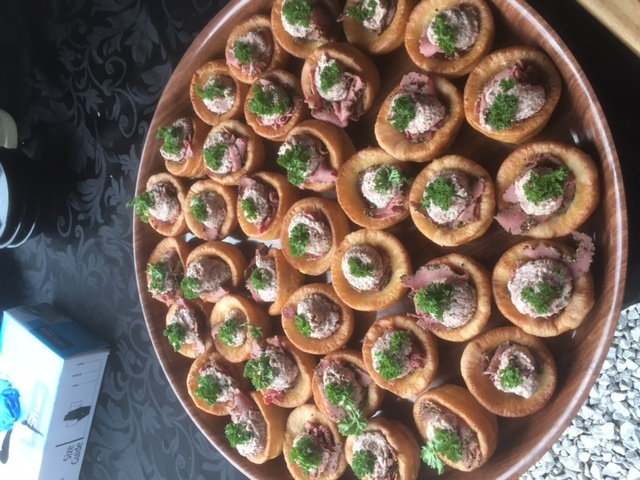 Our team had a wonderful time catering a romantic winter wedding feast on Saturday, enjoying helping to make the occasion a big success for newly-weds Damian and Quinn. Set in a beautifully decorated barn, the informal wedding reception of a Hog Roast Chislehurst buffet followed a church service and fed more than 60 guests in total and they all stripped the huge hog clean! The menu was part-buffet, with the Hog Roast Chislehurst service, and part-sit-down, as we served the starters and desserts to the guests seated at their tables. 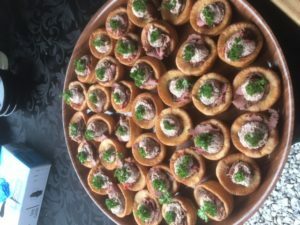 After welcoming them with a glass of bubbly or two, the guests enjoyed various canapés that we provided, including cute but posh mini pizzas and mini quiches, mushrooms in puff pastry, chicken satay, and halloumi kebabs. Most of these were also suitable for two veggies guests, as was the starter of our homemade tomato soup with croutons. When it came to the main course hog roast, we had slowly roasted it on-site for several hours, ensuring it was fresh and served hot to Damian, Quinn and their guests. A vegetarian alternative of homemade vegetable tart was served at the same time as the Hog Roast Chislehurst buffet commenced. Once the queues began to snake around the lovely barn (which was surprisingly warm), I started to carve off plenty of bits of crackling, which was perfectly salty and crunchy (well, a chef has to try what he’s cooked!) Then I sliced into the beast and produced tons of juicy pork pieces, and filled trays with them. The couple had asked us to provide a winter warmer of Hog Roast Chislehurst with seasonal vegetables and potatoes, and for this occasion, they opted for a carrot, butternut squash, and sweet potato medley, plus new potatoes on the side. Our team filled plate after plate with tasty meat, crackling, veggies and potatoes, topped with our scrumptious onion gravy, and accompanied by stuffing and apple sauce. A hog this size can feed around a hundred guests on a real plate, but these 60 guests did extremely well to finish it all off. Once dinner was over, the guests needed to rest a while before we served chocolate-laden profiteroles as well as slices of the happy couple’s wedding cake. Tea, coffee, and mints were then served before it was time for us to clear away and leave Damian and Quinn to celebrate with their loved ones.